It was time to ditch the pre-made seasoning packet, and so I turned to my favorite research tool, Google—182,000 hits. I went through the ‘biggies’: Food Network, AllRecipes, Epicurious, plus a bunch of church cookbooks. I tried ketchup, shoyu, chili powder, honey and mustard until I honed in on the perfectly balanced sweet/sour/salt trinity of Bulldog sauce, Worcestershire sauce and red wine vinegar. The experimentation process was very un-tasty a few times, but I haven't used a seasoning packet since then. My preferred version (shown at left) is open-faced with a slice of extremely sharp cheddar cheese, a drizzle of brown mustard and a bit of relish. However, my kids think this is just gross, and eat traditional sandwich style with only a smattering of grated cheddar. Add just enough oil to coat the bottom of a pan very lightly. Add meat and break it up as much as possible. Add the onions and cook until soft. Add red peppers, spices and tomato sauce. Bring to a low boil and then simmer for at least 10 minutes, ideally 20. 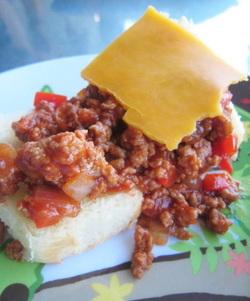 Toast bread and build your own sloppy joes.